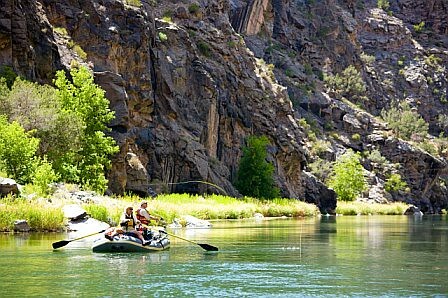 We returned from a fun weekend in the Black Canyon/Gunnison Gorge catching some fish and way to much heat. 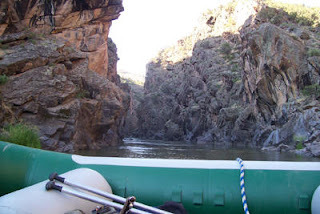 Everybody seemed to catch a fair amount of fish and enjoy some rafting down at the edge of the Black Canyon. Most of the fish we caught averaged 14" so nothing to big stacking up on the bugs. Dr. Fred did manage a decent Bow late one afternoon as well as Jason Sat morning that were around 18-19". Most of the flies we had success were #22 Chartruse Copper John, #20 BH Green Tungsten, #8 Golden Stone, #16 EHC, #12 Black bodied Caddis, #18 Black foam caddis, #16 Red Copper John, and a few other variant Stone fly imitations. Besides being a week early for the bugs to go off we still managed to have a good time, some good food and crazy Leroy, the Pleasure Park operator was always great, "Everyday is fishing great and the water is perfect this weekend he says!" The guys hit the Blue river in Dillon and I decided to try out some good hatches on the Frying Pan. Managed about 15, many on top and lost a big one that took me into my backing before breaking me off! 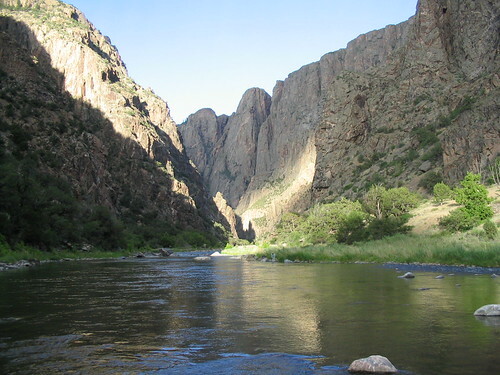 If you decide to fish the Gunny inside the Black Canyon,it is only for those in great shape and those ready for an adventure. Steep canyon trails require significant physical effort just to get to the river, but, oh, is it worth it! Located near Montrose, Black Canyon National Park is one of our nation's newest national parks, but the area's rich history goes way back. The East Portal Road gives those fishermen unwilling to hike into the canyon their only chance to fish the river within the park boundary. Here one has a chance to land a tail-wagging rainbow exceeding 20 inches and hook feisty browns to 15 inches. 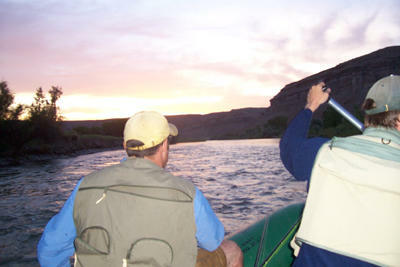 Deep pools and fast riffles are equally suited for spin or fly-fishing. Although the Gunnison had not been stocked for many years, whirling disease has made it necessary to do some stocking in recent years to boost trout populations. 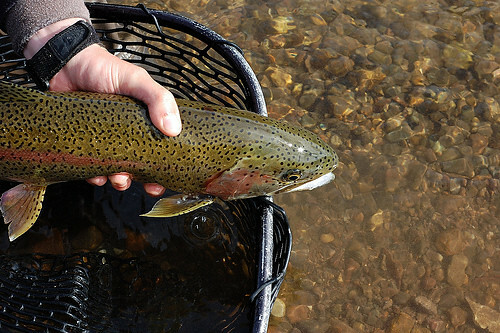 The Colorado Division of Wildlife has stocked 66,000, 5-inch Colorado River rainbows in the Gunnison Gorge according to Sherman Hebein, senior biologist for the CDOW. "The stocked rainbows are doing very well," said Hebein. "It's good to know the larger fish are surviving. We plan to stock another 90,000 next year." 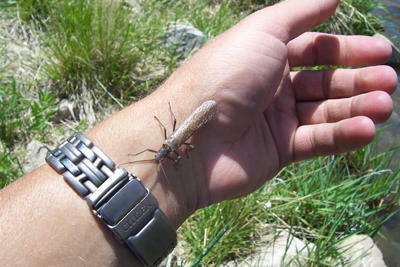 Flyfishermen do well primarily on nymphs. Using a weighted fly or a weighted leader, a tandem of flies fished with a floating line and a strike indicator must be intently watched for a down-under strike. With a 9-foot 5 weight rod, cast above the run so the fly is down near bottom by the time it reaches the head of the run.Runs of 3 - 4 feet deep, 2 - 3 feet wide, and 10 feet long or more with slow current in the run, next to faster water, are ideal. Fish hold in these runs, especially the larger trout. 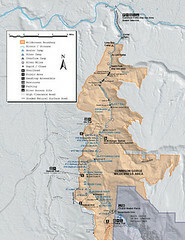 Black Canyon National Park is near Montrose, Colo., off U.S 50.
north to the park's entrance and the nearby Visitors Center. A $7 entry fee is required. Fee camping is available. Free permits are required to hike into the inner canyon. Contact the National Park Service at (970) 641-2337; online, go to www.nps.gov/blca. or Jeans Westerner, a clothing and outdoor gear store at (970) 249-3600 or www.jeanswesterner.com.